I am a big YouTube user for both professional and personal use. When it comes to personal use, I want to make my videos private and share them with friends and family. The issue was that you had to get people to sign up to YouTube and then share their username with you. You then add them as friends on YouTube. It was a big hassle. Sometime in the past few months, YouTube added a new feature that let's you share your private videos via a special URL. Your friends simply click on that URL and they can see the video. They are required to have a YouTube or Google Account, but you don't need to know what their account name is - you just send them the URL. As you can see, there is an option to give out a URL to up to 25 people, to view the video. *** You cannot share a private video with more than 25 other users. If you'd like to share the video with more people, you'll need to set the video to "public". 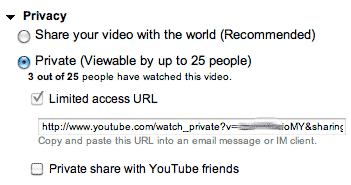 *** Once a videos is shared via the private URL, it cannot be unshared. Therefore, use your 25 invites there wisely! *** The "Limited Access" box won't stay permanently selected until someone accesses your video for the first time- even if you've marked the video as private and sent the video to your friends already. Someone must first watch the video before the "Limited Access" box will appear selected. *** In order to watch a private video, your contacts must already have a YouTube account. If they don't already have an account, they'll first need to sign up for an account, and then once they've activated their account they'll then be able to sign in and watch the private video you sent them. If they do not sign into their account before watching the video, the video will not load. I, for one, am glad they added this feature (again, I know it is a few months old).